Realtors who used FastForward gained a huge competitive advantage and skyrocketed their sales, SEO rankings, and Reputation. If you're looking for a fast and effective way to increase your Sales, SEO rankings, and Brand Reputation, then this will be the most important website you read all day. I'm going to share with you how a unique video tool that can be placed on your website in less than 5 minutes can help you dominate the competition and increase your lead traffic overnight! Video content is the favored way for people consume information on the internet. Text-based websites just aren't good enough anymore and video is the way of the future. And the type of videos that excel above all others for driving targeted customers to your website is Explainer Videos. Explainer videos are the most effective way to educate your customers on services you provide and help you generate high-quality life long customers. Every major real estate company is starting to realize the power of explainer videos and they're spending millions of dollars to create their video content. The only problem is most of us don't have the time or resources to create our own branded video content. And if you try and outsource this work to video creation companies who make custom explainer videos, it can cost as much as $5,000 for a 1-minute video! My name is Matthew Dunn, and I'm the leader of the team behind FastForward. It's a one-of-a-kind video content service that gives you access to hundreds of high-quality realtor explainer videos that can be incorporated into your website and online marketing quickly and easily. Each explainer video was custom made to educate your customers on everything from buying a home to selling a home. The best part is every video can be custom branded for you - up to hundreds, instantly. This gives your customers access to short, engaging and useful videos "from you" that will help educate and build trust in your brand. This leads to higher quality leads and more-informed customers who see you as the expert -- 21st-century style! 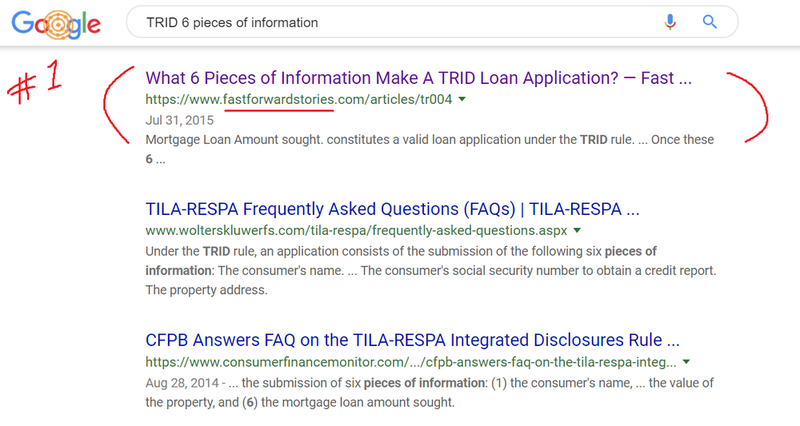 Before we added a video and page talking about “TRID 6 pieces of information” we were not even in the top 10 of google results for that keyword. After integrating just one video on our website, we became the #1 result for that keyword. Google gives websites with video content on them more authority than plain-text websites. Now imagine adding dozens — even hundreds — of pages to your website, with a unique branded video and pre-written articles, to help dramatically increase your search engine results. Not only would Google love your website even more, but your profit margins would skyrocket thanks to all the free traffic Google will be sending you! Your competition will be left in the dust and you'll build more brand authority over them because your name shows up above theirs in a Google search! Video posts on social media increase engagement by up to 73%! With access to over 150 custom Explainer videos, you’ll have the kind of high-engagement video content that social media loves. Just share your custom branded videos across your social media platforms and watch your social engagement explode! Video content gives you more opportunities for your content to be shared and consumed across the internet, driving more high-quality customers to your website. 90% of information transmitted to the brain is visual and according to the Social Science Research Network, 65% of humans are visual learners. If you look at some of the fastest-growing social networks – Pinterest, Instagram, Snapchat, Tumblr – it’s easy to see that the way people are consuming content is drastically and quickly changing, and the value of visual content will only continue to increase in the near future. Fastfoward isn’t just great for social media. It’s also a perfect fit for your email promotions, newsletters, customer questions and more! Integrate FastForward Into Your Emails For Better Results! Writing emails can be one of the most challenging and time consuming tasks for any business. However, with Fastfoward all the heavy lifting is done for you. FastFoward can be used with any email service providers including bombbomb. Easily integrate any of our videos into your email and dramatically increase your email engagement and click through rates. Let’s say you have a client named Mary who just found her dream home. Now she needs to begin the loan pre-qualification process. Instead of spending 15 minutes or more on the phone with Mary, You can send her an email with an explainer video from FastForward that explains everything she needs to know about the loan process. This frees up time for you and your employees while giving Mary an easy way to visually understand the process. As Mary continues down the path of home ownership there is a video every step of the way to help her through the home buying process. Now imagine how thrilled Mary would be to recommend your company to her friends after you made the home buying process simple and easy for her to understand? This is what makes explainer videos so powerful for your business. We’ve broken down FastForward into 4 levels, based on the number of videos. You can see each subscription level above and what videos are included with each level. Once you choose which level best suits your needs, click the button to get started! Each video is branded front & back. You upload logos, pictures and key information; we'll provide branding proofs. Library setup takes about 1 business day after branding approval. STEP 3: INTEGRATE FASTFOWARD WITH YOUR WEBSITE, EMAIL, SOCIAL MEDIA! All videos in subscriber libraries are available immediately. Mobile-ready web portal with all videos. 1-click embed codes, email merge tags & social links. Website-ready import files, including 1 article per video. All videos come with English and Spanish captions. Short ‘teaser’ video files and animated GIF files, with your branding, are included. No long term commitments; just a simple 30-days notice should you decide to cancel. Try FastForward Today and Save THOUSANDS! Normally, to get hundreds of custom made explainer videos made it would cost you HUNDREDS OF THOUSANDS of dollars in production, plus IT setup costs and video hosting. But right now you can get access to hundreds of customized branded videos, fully hosted and ready to be placed on your website, emails, social media and more for a fraction of the cost. Nowhere else on the internet will you find such an amazing value for the price. There are no setup fees and all videos are hosted through our lightning fast cloud services so you never have to pay for video hosting fees! And that's the price you pay FOREVER if you start using FastForward today. We can't guarantee this price will be the same a week or a month from now. We know our services are incredibly under-priced, and subscription rates will go up in the future as demand increases. But if you join today, the price you see is the price you pay forever. This is an amazing opportunity to jump ahead of your competition and drastically increase your traffic, sales and brand authority. Try FastForward today and see the results for yourself. I guarantee FastForward will be the most profitable decision you've ever made for your business. Fast Forward Stories provides engaging subject matter with the expertise necessary to very clearly explain a variety of complex categories. The videos simply walks the viewer, step by step through the information that can otherwise be very confusing. All the qualities of Fast Forward Stories have exceeded my expectations and as a result, I am continually gaining the trust of numerous potential buyers and sellers and becoming a sought after, value-added business partner. I have been receiving almost daily praise over the video content. Viewers love the topics and rave about how thoroughly they are explained in layman’s terms. The videos are easy to understand and very entertaining to watch. Producing, writing, editing, and starring in a television show for NBC and The CW is extremely time consuming and tedious. With Fast Forward Stories, I know that there is one less segment to worry about for each episode. Matthew has been incredibly helpful and always responds to my questions in a timely matter, thus making my entire relationship with Fast Forward Stories nothing but enjoyable. Fast Forward Stories is by far one of the best providers of content that I have incorporated in the show. The value that the videos add is tremendous and I thank you for that. Click Here To Get Started and Add FastForward To Your Website Today! P.S. I want to remind you that the price you see right now, could change at any time as demand increases. This is the lowest our price will ever be so if you want to lock in this price forever, then grab this opportunity while you can. WHAT CAN I BRAND ON THE VIDEOS? HOW? The image that shows before a video plays is called a thumbnail. We develop creative treatments from subscriber logo, graphics and company info. On approval, we produce the thumbnails (1 for each video) and apply them to the library. The image that shows up after play is complete is called a 'brand overlay' or 'call-to-action graphic.' We'll develop those along with thumbnails. You can also create your own graphic (1280x720 PNG) and send it to be applied. HOW DO I CUSTOMIZE MY LIBRARY? You fill in a web form with your brand information. Provide text and graphics (logos, pictures, background images). We'll create the required graphics and apply them to your library. Yes, you'll get proofs. Yes, we'll revise them. Yes, we'll update them for you if something changes. CAN I PUT THE VIDEOS ON MY WEB SITE? Yes. We provide web import files with written articles and the video embed codes for your library. Formats include plain text for easy copy/paste, a Wordpress import file, and HTML code for an easy one-page library. Post all of them, or some of them - you're in control. CAN I SHARE THE VIDEOS ON SOCIAL MEDIA? Yes. Everyone on your team has access to your video sharing portal - a web page with your whole library. Each video has 1-click social sharing buttons. They can also just paste the video URL into posts or tweets. CAN I SEND THE VIDEOS IN EMAIL? Yes. We create embed links automatically, with custom links for most of the major email marketing platforms. Here are some of them: ActiveCampaign, Act-On, AWeber, Campaign Monitor, Constant Contact, Dotmailer, Drip, Emma, GetResponse, HubSpot, iContact, Infusionsoft (Keap), Mad Mimi, MailChimp, Marketo, Ontraport, Pardot, Sendible, Vertical Response, WhatCounts - plus Standard HTML for other email/CRMs. These insert the correct thumbnail into email messages, and link to the landing page you choose. For desktop email - just right-click on any video. Select "Copy link and thumbnail" - then paste into your email message. CAN I TWEET AN INDIVIDUAL VIDEO, WITH MY BRANDING? Yes. And it plays right in the page with the tweet. Your logo & customization details pop up at the end, and the window is linked to your URL. DO THESE PLAY ON MOBILE DEVICES? TABLETS? Yes. Single videos (sent as a link, or on a web page) are best. Yes. Auto-switching, device sensing. Flash where the device supports it, for now. Global content distribution network backing it all. Amazing technology. CAN WE GET THE VIDEO FILES? Teaser files — short, fully-branded-for-you — in both video and GIF formats are included with subscriptions. Full-length video files are not. CAN WE PUT THE VIDEOS ON YOUTUBE? HOW DO YOU SECURE SUBSCRIBER DATA? Set up a password for yourself. The next screen will include an “Update Billing Information” button. If you've gone through this before, just log in and change your information. Call (888) 618-9088 or email help@fastforwardstories.com to cancel. We'll stop your subscription renewal. Your video library will be deleted at the end of the period, and the videos will stop working. We'd appreciate knowing what we can do to keep your business, of course! Or give us a call - (888) 618-9088 - during Pacific time business hours.